What happens when a $2.1BB+ organization re-commits its 20,000+ people to its vision and values?! 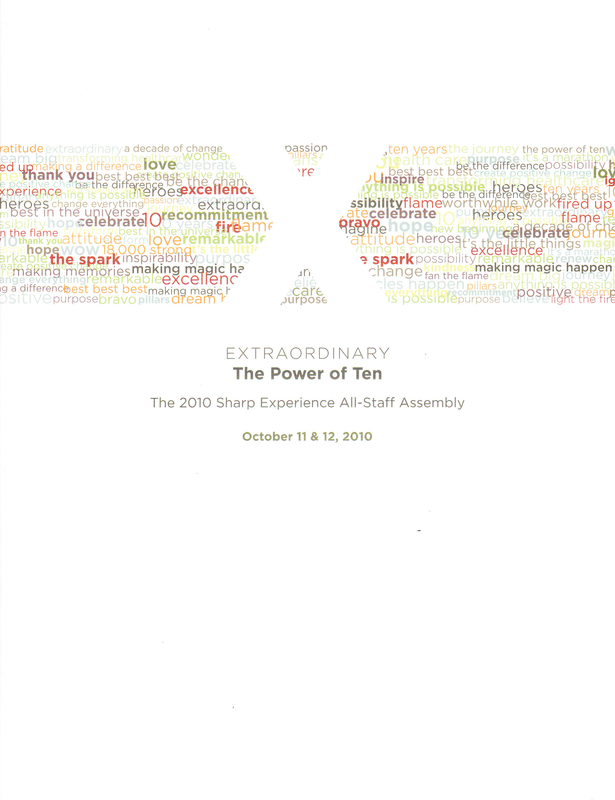 I got to find out last week when I attended “Extraordinary: The Power of Ten” the All-Staff Assembly put on by Sharp Healthcare. Thanks to a generous invitation from Mark Tomaszewicz, the director of The Sharp Experience, I got to experience first-hand the truly remarkable event. Sharp is in the 85th percentile of national rankings in patient satisfaction. Last year for the third year in a row, readers of The San Diego Union-Tribune recognized Sharp HealthCare as San Diego’s “Best Hospital” in its Best of San Diego Readers’ Poll. In November 2007, it received the Malcolm Baldrige National Quality Award, the nation’s highest presidential honor for quality and organizational performance excellence. And even though Sharp is a non-profit, its financial performance is significant — it has grown its market share leadership for 10 years in a row. It’s part-inspiration, part-education, and part-celebration. The Assembly makes a powerful statement about how important the organization views employee engagement to The Sharp Experience. The Sharp Experience All-Staff Assembly Highlight Reel by DLYohn from Denise Lee Yohn on Vimeo. I was blown away by the event. That Sharp would invest the time, money, and energy to put on this kind of event is, well, extraordinary. Throughout my career, I’ve been involved with a lot of corporate efforts with similar objectives, both as a producer and as an attendee, but nothing comes close to what I experienced. 1. Multiple entry points to understanding The Sharp Experience – The event included a full-range of experiences which allowed the attendee to engage with The Sharp Experience content in different ways. From the moving videos of Sharp patient stories, to the awards ceremony acknowledging people’s distinctive performance, to an inspiring spoken-word performance by Sekou Andrews, to the crazy dancing in the aisles, to the provocative speech about unlocking human potential by Sir Ken Robinson, to… Regardless of where you were coming from, what kind of input you prefer, and whether you wanted to learn, be inspired, have fun, or be challenged, the event connected with you. I once heard MIT Professor Marvin Minsky talk about the importance of experiencing something in multiple ways in order to really understand it. This event demonstrated this principle. It offered up different ways to understand The Sharp Experience and in doing so, ensured that all Sharp employees were re-engaged in its vision. 2. Fun! – The event was a lot of fun. And I don’t mean that kind of manufactured fun that corporate events often feature – you know, the kind that seems a little awkward but you feel like you have to play along in order to show your corporate spirit. The Sharp Assembly was truly fun. It started when you walked up to the event – employees formed a tunnel of cheering and clapping for each and every attendee to walk through. And the fun lasted through to hilarious videos of executives doing Harry Potter spoofs and Beyonce moves. The event lasted 4 hours but the time flew because it was fun. Healthcare is something to be taken seriously but I applaud Sharp for making it fun. 3. One brand – Oftentimes when I’m speaking to people about employee brand engagement, the question of employee experience vs. customer experience arises. Companies increasingly use terms like “employment branding” and “internal branding” to describe efforts to create a unique employee experience which they can promote in the recruitment process. People ask me if “the consumer brand” and “the employment brand” should be related — and how. The Sharp Experience – and the way it is served up at the All-Staff Assembly — answers the question more clearly and convincingly than I ever have: It’s all one thing. There isn’t one way of talking to patients and another for engaging employees. There aren’t two separate set of values which define what it’s like to work at Sharp vs. to be treated at Sharp. The Sharp Experience weaves together seamlessly the employee experience and the patient experience into a single symbiotic experience. The result is a brand and an organization with clarity, focus, and integrity. From my experience at the All-Staff Assembly, I’d say they’re well on their way.